There are several manufacturers of AR glass fiber, including NEG America, Nycon, Rich Fibers & Systems, and Owens Corning. Owens Corning recently bought Saint-Gobain's Vetrotex glass fiber business (Cem-FIL) and has transferred sales and marketing of its concrete-reinforcing fibers (including AR glass fibers) to Continental Marketing's Rich Fibers & Systems. The alkali resistance of AR glass fibers is a result of adding zirconia (zirconium oxide) to the glass-the best fibers have zirconia contents of 19% or higher. The fibers used for countertops, fireplace surrounds, and other decorative applications are high integrity (meaning the strands don't break down into individual filaments) and are usually ½-inch (13-mm) long or a combination of 13, 19, and 25 mm. "A strand will contain anywhere from 50 to 200 filaments," said Michael Driver, Division Manager with Nippon Electric Glass America. "That's what gives you the pseudo-ductility. Since you haven't locked in every filament you get fiber pull-out and that's what provides the ductility. The tensile strength of the glass fiber is higher than that of steel and the modulus of elasticity is 3 times that of concrete so that when you put stress into the concrete system the glass absorbs the energy and won't allow it to crack. 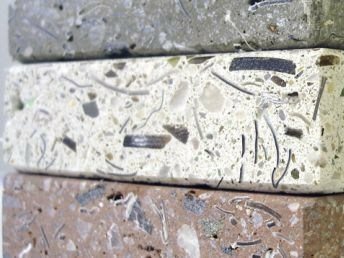 Polypropylene fiber is great for reducing plastic shrinkage cracking but it can't stop tensile stresses in the hardened concrete--it can't stop cracking. With glass you don't really get any elongation-if it does fail it's more of a brittle failure. The yield strength and the ultimate strength are basically the same. Some people see that as bad but it means you simply design to stay within the yield strength." 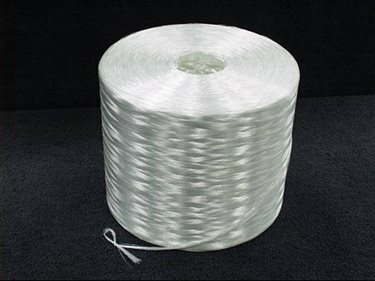 AR-glass fibers are also available as roving, which is a spool of a continuous length of multiple strands of glass fiber twisted together (typically 28 strands in a roving with 200 filaments per strand). In regular spray-up GFRC, this roving is fed into a chopper gun which cuts the fibers to a specific length as they are mixed with the concrete as it is sprayed. Glass fiber is also available as a scrim, which is a fiber fabric. This is placed into areas that might have a tendency to crack. "Our scrim isn't woven," said Driver, "the fibers are laid on top of each other and glued together using an organic substance." Another fiberglass reinforcement for concrete and mortar is lath-SpiderLath makes AR glass lath that can be used as a base coat for stone veneer or stucco or as reinforcement in concrete countertops. Chomarat North America (which makes C-Grid, a carbon fiber reinforcement grid that is used in countertops) also makes a fiberglass grid reinforcement they call MeC-GRID, which is bonded with an epoxy resin. Glass fibers, according to Nycon, "pose no health hazards, since fibers with diameters greater than 3 microns cannot be inhaled." AR glass fibers are typically 13 or 14 microns in diameter. 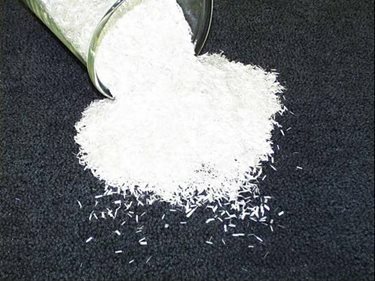 Nycon's Bob Cruso recommends a blend of fibers, using glass fibers in combination with polyvinyl alcohol or nylon fibers to control plastic shrinkage cracking.